Becky Hostetter always had a dream to open her own store. The lifelong San Diegan and longtime OB resident had been keeping tabs on potential storefront openings in the neighborhood for a while. When the location next to the ABC Liquor store at Voltaire and Ebers opened up over the summer, she jumped on it. It seemed like a dream location. Hostetter called her new store Urban Upcycle, which specialized in used furniture that she would refurbish. Tony Kiryakoza, whose family owns the ABC Liquor and the adjacent 310-square-foot location where Hostetter’s store was located since 1993, says there have been numerous businesses that have come and gone over the past few years, including short-lived iterations as a shoe repair store, an auto repair place and a couple different thrift shops. In just the past two years, the storefront has had at least three businesses come and go. The Voltaire Trading Company held the spot for a while before moving to a different location down the street. The place is now closed and the owners reportedly moved to Washington. Then came some sort of Rastafarian spot, which Hostetter kept tabs on because she really wanted the spot. So after the guy’s lease ran out in June, she finally got her chance and opened the shop, complete with a peace flag in the window she got from a protest rally of the Iraq war a few years back. But after six months of losing money, she just couldn’t do it anymore. Her story is all too common for places on Voltaire that just can’t sustain the business without the foot traffic of areas like Newport Avenue. 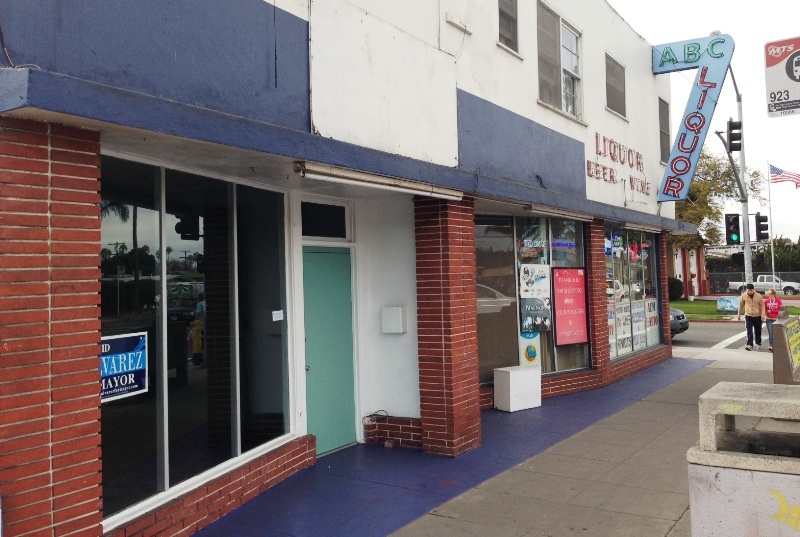 Hostetter would like to see the Ocean Beach Merchants Association give more attention to businesses on the street. He also thinks the right places haven’t been opening up in the location. He says he would put in a sunglasses store or a place to buy t-shirts and sandals. Meanwhile, her OB dream deferred, Hostetter has resigned herself to selling her furniture online and out of her home. She hopes to find a spot in South Park sometime soon to give it another go. She said she really likes the way that neighborhood helps support local businesses. And the people are more apt to buy local. Would she give it another go in OB? It was interesting enough for you to read and then comment. But yeah I would agree that perhaps this was the wrong kind of business for that street and that has more to do with why she didn’t make it rather than people not having the money to spend. Oh geez that was uncalled for, I know Becky at least casually and every time I’ve spoken with her we hit it off well and she is very positive and personable- more, it would appear, than I can say for you. Part of the function of a local publication like the Rag is to put the spotlight on local business- even if sometimes it is the rather depressing subject of telling us what happened to one that disappeared. As a footnote, I also met the owner/manager of Voltaire Trading before they closed at their last location, and it struck me how hard working and cheerful she was. This really frames the underlying story about how bad the economy is in OB and elsewhere. Money is tight. Having a dream (that isn’t such a bad idea at least in better times) and working hard at it and being a nice person people want to do business with, still isn’t good enough. I did get a chuckle out of the “better” plan of a sunglasses/T-shirts/sandals retailer so far off the beaten path of the beach. Plenty of that on Newport, and you’d be hard pressed to compete with the selection of superstores like Wings in that 310 sq. ft. Frankly the best thing for that space would be an expansion of ABC’s business into perhaps food, as Litticker’s did some years ago. About all it has going for it location wise is a fairly busy bus stop in front, so- all you could capitalize there on is what ABC already does, a convenience store. That’s about all you could do with it and you couldn’t even serve food as a stand alone business, as I understand it doesn’t even have restroom facilities, is there even a deep sink in back? So maybe the fault of the location is not in its tenants but in the meager facilities provided by the building owner. Interesting thoughts, John. I agree that it’s probably too far off the beaten path for a beach wear store. Becky told me there was no bathroom or back room, which probably isn’t helping things. Agree with OB Wood. Thoughtful ideas by John. And yes, I too was told by the woman who ran the Trading Co that there was no bathroom on the immediate premises. That can be a real bummer, dude! Hardly any walking traffic, no businesses east (used to be a beer and liquor store down Voltaire east), lack of good parking, yeah these are all decent reasons, but why does ABC do so well? ABC thrives because Ebers is the N-S spillover route for commuters avoiding Sunset Cliffs, it’s very busy during rush hour, and packaged “libations” are a product of necessity for many. (browsing a furniture/thrift store is a leisurely diversion) Their rear parking lot is seconds off their mad dash home. I think the restroom thing can’t be overstated, to make a retail establishment work you’ve got to have set hours (and thrift/resale stores are their own destination, not an afterthought people see on the way home) and nothing is more irritating than driving somewhere expecting a store to be open but it’s not. Can you imagine the owner trying to last 9-10 hours without going to the bathroom or having a place to wash up? How many potential customers would you lose for good when the “be back in an hour” sign was up? Finally on the nature of her business being a “destination”, in Poway there is an older shopping center filled with ONLY small thrift stores. Just like an antique district. While I may not drive 10 miles out of the way for one store if there’s 10 stores to browse it makes the trip a winner. You’re spot on. I can’t tell you how many times I drove by there wanting to go in and check it out, but there was no parking. Or I would ride my bike over on a Saturday and nobody was there. So frustrating I never tried again. It’s my town too, IB. I’m just reporting what is going on. Thanks for reading, and thanks for the troll. I realize this story is old but I just came across it, mfamily owns ABC Liquor, and I’ll tell you that we have tried ourself to open up some type of business in that ‘black hole’ ourselves and it failed. I don’t know that a lack of a bathroom has anything to do with it. There is a lack of parking, and the city won’t allow us to create more spaces in the back of the store because of the need for handicapped parking which takes up 2 spaces. The parking area is very small, not much that can be done by us about that. We even looked into putting a restaurant in there or expanding the store to include a deli/coffee area, but the city won’t allow it without having more parking spaces, which again is impossible because of the lack of space. It’s a no win situation for anyone. Tough spot for sure – not only does Voltaire get a lot less commercial traffic than Newport, but also being east of Sunset Cliffs by a block has to hurt. I’ve seen a ton of businesses come and go there over the years, hope somebody can find a way to make it work eventually…and best of luck to Ms. Hostetter with her online endeavors and/or in a new location. Cool business idea, but unfortunately I’m one of the folks with no money to support it. I have her phone number. E-mail me and I can pass it on. mcwood44@yahoo.com. Perhaps a medical marijuana dispensary with a pro bono charity aspect & free samples of product to (ill) patients might make a go of that tough spot? Or a bikini-wearing staff manicure/pedicure business? There are tons of ideas that might work if you think outside the box. Hey sorry Wood. Don’t take it so hard. I was unaware a little criticism constituted trolling. You’re putting your work out for evaluation and comment. Perhaps you’re a bit sensitive for such endeavors? My apparently misunderstood point was that many business begin and end in OB, but your article failed to provide any real news of value, other than perhaps the contact information for a qualified furniture repurposer, or maybe that what has always been a horrible business locations is still a horrible business location. Not bagging on the proprietor, other than saying it was the wrong idea in the wrong spot. To your credit, it has sparked a bit of conversation, which is always good… unless it degrades to name calling. Nothin’ but love, IB. I would argue that it is news because it affects our community. So would the others on the site, apparently. Good to see you care about the area, though. We all do, for sure. I don’t think this one can be blamed on the location or a failure of local residents to support local businesses. No disrespect to Becky, her chair planters are lovely and would look great in any home in the cottage or eclectic style, but they are old chairs recycled into planters, and that’s a niche market if ever there was one. I doubt she would have done any better on Newport, frankly. I cross that intersection regularly, always passing at least one other person on foot when I do, and the best business idea for that location is a small coffee stand because the closest is on Cable and Voltaire, which is inconvenient if you’re heading away from the beach on foot. Or a small family restaurant, if they could add a bathroom. Parking is a problem. ABC liquor sometimes loses our business to Litickers, if we don’t have time to walk up there and don’t want a big fuss for parking. Just to clarify, I don’t mean to suggest the area gets heavy foot traffic comparable to Newport or the beach, but because I walk there all the time, I can report that it gets a decent enough amount of foot traffic primarily from residents North of Voltaire heading to the playground, elementary school, church, People’s, beach, etc. I think it could easily support a nice little family restaurant (if a bathroom could be added) or coffee shop. It’s not a good spot for a retail business except maybe a dry cleaner or some other sort of necessity service business. And maybe it’s the result of editing out some important context and unintentional on Becky’s part, but I’m annoyed by her tone at the end that suggests OB residents just don’t want to support local businesses and that she’ll consider coming back if we change our culture. Come back with a good business idea for the location and I think she’d find plenty of support. Bernies bicycle shop was there for 10yrs or more seemed to do ok until the mid 80’s if I recall. Perhaps its less the location and more the products & services being provided that is the issue. Not sure if the past 3 shops would have had a suffcient business model to survive in any location given the economy/rent paradigm. It would appear Stephanie’s has joined the list of closed OB stores on Voltaire. Although I was not much of a customer I will weep for them still. Honey Bee Cottage is no more…closed for renovation a month or two ago…never reopened and for lease/sale sign.